CoBudget is Perspectivity’s own ‘crowdfunding’ tool. It is a great tool and platform to collaborate and create a space for participatory financial decision making. As members we envision boosting entrepreneurial activity and new ventures, as well as, wish to experiment with a new model for funding social and economic activity. Through CoBudget, you can propose ideas and request funding, you can invest yourself, or do both. The idea is to put money in the middle, decide together how to spend it to collaborate and make stuff happen. We invested in a great Perspectivity Fest about navigating complexity in times of transition. We contributed to the Arab Youth Conference of het Grote Midden-Oosten Platform, resulting in a booklet that will be presented to Dutch Minister of Development Cooperation Sigrid Kaag. We financed a big chunk of a Sprockler animation. The next round was opened during the Perspectivity Fest and will remain open until the 15th of January 2018. If you haven’t participated before and would like to join this round, you can register with Monique. After registration, you will receive an invitation for CoBudget. When you have accepted the invitation for CoBudget you can propose a bucket, invest in other buckets or do both. The amount you invest is up to you. If you have taken part before, you do not have to register again. The floor is open: this is your chance to get your own initiative funded and/or support great activities of others. If you did not invest yet, you will keep your 100 Euro. You are of course free to put in more money and make more investments. The additional money (that was invested by the Network, Enterprise and the Game fund) that is left over from the last round will be redistributed between all participants. The next phase will started on 3 November 2018 and will last until 15 January 2019. Every member has influence on what funding goes to what activity. Every member has equal chance to get their ideas supported. Individual members (volunteers and enterprise alike) become owners of the activities in Perspectivity. The monetary assets are shared between members. The individual designation of budget will show group preference for certain projects and thus provide lessons how to prioritise budgets. Individual pet projects must stand the test of the group and must otherwise find funding elsewhere. It all starts with ideas and funds. Create bucket ideas (A bucket is a request for funding – a container to be filled with money, anyone can start a bucket. A bucket can be for a project, event, expense, anything you want to pitch to the group for funding) and get feedback on them to improve them. Anyone at Perspectivity, regardless of if they have contributed funds, can start a “bucket” – a proposal to do work for Perspectivity that requires funding. They write up a proposal making their case for why the work they want to do will benefit everyone, help Perspectivity achieve its strategic goals, further the social mission, and why they, the proposer, are the right person to deliver the project. A bucket is a request for funding and can be a project, event, expense, product, service. Pitch what you’re looking to accomplish, how you’ll deliver it, how it aligns with the philosophy of Perspectivity, what the added value is (also for funders), what is the business model. You need to sell your idea. 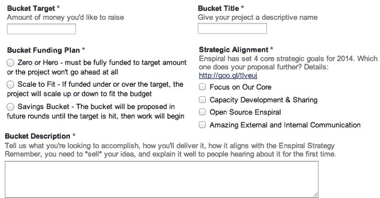 Savings Bucket – the bucket will be proposed in future rounds until the target is hit, then work will begin.